According to Recipes To Go’s culinary dictionary, Involtini is defined as “thin slices of meat or fish which are stuffed and rolled. They may then be sautéed, grilled or baked.” Bizchickblogs.com featured Chicken Involtini by Italian Mama Chef Michelle just in time for dinner. Yes indeed, I had planned to serve chicken that evening however not a single a recipe seemed appealing. Hubby always says my demeanor is reminiscent of a leaf floating in the breeze. That ‘free spirited” approach oftentimes leaves me pressed for time, as you can imagine. Not only was this an enticing chicken recipe but easy to prepare too. Making several changes to the original recipe to coincide with my on hand ingredients standard, the chicken rolls were stuffed with chopped fresh lime basil, minced garlic, and fresh tomatoes. Place one piece of chicken under a piece of plastic wrap and pound to about 1/4 inch. Sprinkle each piece with salt and pepper. Add the cheese, divided among the 8 pieces. Lay a few slices of tomatoes on top of the cheese. Begin rolling up from the smaller end. Tuck in sides as needed to contain ingredients. 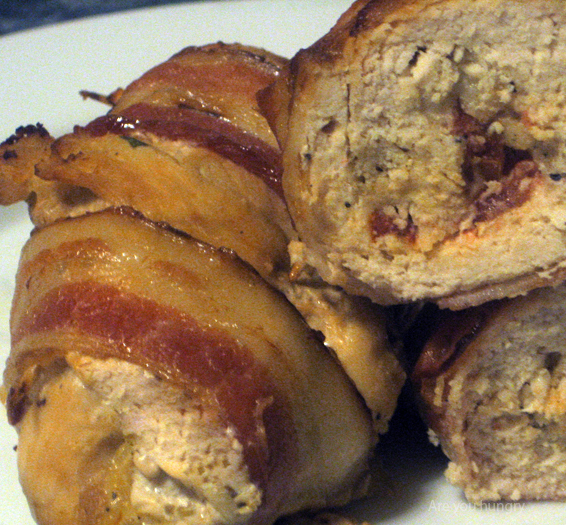 Wrap with a slice of bacon, stretching it around the chicken. Secure with toothpicks or cooking twine. Heat the oil in an ovenproof skillet on med heat. Add the garlic, chopped into a few pieces. Heat until fragrant, remove after a min or two, and set aside. Carefully place the chicken rolls in the pan and allow to brown, slightly cooking the bacon on each side. Once the Involtini is nicely browned, return the garlic to the pan. Place skillet in the oven and cook for about 30 min. or until chicken is done. Use a meat thermometer and make sure the chicken is 160 degrees. If you like cooking Italian food, check out Michelle’s Italian recipes at Italian Mama Chef or her featured postings at Bizchickblogs.